Mapping the History of Religious Freedom in Queens. 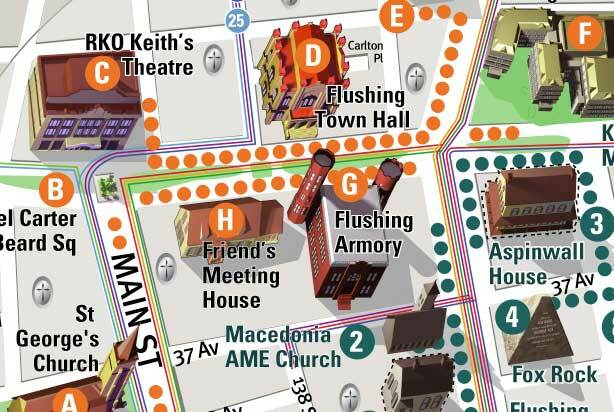 VanDam is working with various government agencies including NYCEDC, NY DOT, and the City Planning Commission on a pedestrian way-finding system for Downtown Flushing. Large-scale map panels at key locations are paired with interpretive history panels to communicate the Quaker’s struggle to secure religious freedom under Dutch colonial reign. The key is to make this history understandable and meaningful to a primarily Asian–American population. By mapping former and current houses of worship along two historic trails the map links past experience in the struggle for religious freedom to the present.